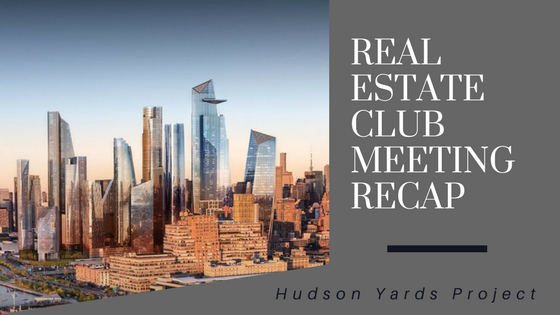 On Thursday, February 22, Dean Shapiro of Oxford Properties Group presented to the Real Estate Club regarding his involvement in the development of Hudson Yards in New York City. Attendees were first introduced to the concept of Hudson Yards, a 28-acre mixed use development in downtown Manhattan situated above a functional rail yard. The new neighborhood would be built on top of a platform over the still active rail yard. The city had been contemplating a development on this site for several years in conjunction with different developers before Oxford Properties and The Related Companies were ultimately chosen to follow through on the idea. Mr. Shapiro remarked that because this land was solely a rail yard prior to the redevelopment, there was no substantial opposition of their efforts. Mr. Shapiro then explained the linkages that make Hudson Yards such a spectacular location. These include the Hudson River Park, the extension of the subway to the new Number 7 Station, and perhaps most notably, the High Line. The High Line is a heavily trafficked elevated green space in Manhattan that leads to the Hudson Yards development. Hudson Yards is also ideally located between expanding popular neighborhoods. Finally, Mr. Shapiro spoke on the space created at Hudson Yards. The development is coming online in phases, with the commercial component in the east being constructed and leased first. The western half will include the residential space, and half of the total land area will be open space by requirement. To resolve a unique challenge, the tree wells need to be refrigerated because diesel engines from trains below produce heat that is toxic to plant life. Mr. Shapiro also shed light on procuring financing for the development, and the tenants who are moving into the office space. Hudson Yards is attracting major tenants because of the opportunity for firms to be influential in the design of the space as it is constructed, and the nontraditional office space modeled for the millennial workforce. Thank you to Mr. Shapiro for presenting to the Real Estate Club, and if you would like to know more about the Hudson Yards development, please visit hudsonyardsnewyork.com.